So a hearty stew was still in order. 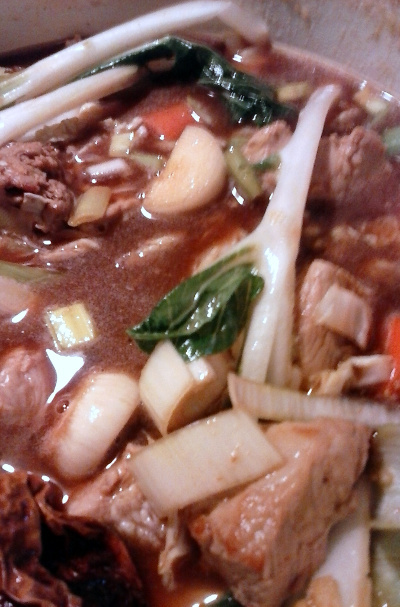 This Chinese style pork stew has a ton of vegetables and my favorite “hot and sweet” combo in Asian cooking. It can be made in a slow cooker, but as I was home, I used my Dutch oven on the stove – the house smelled luscious! Now, be careful when you read the ingredients – don't do like I did and buy several HEADS of bok choy! It calls for stalks, and one or two heads (like a bunch of celery or head of lettuce?) is sufficient, lol. Fortunately I didn't buy as much as I had misread, and I'll let you know what I do with the extra You'll definitely want to use some fresh as an ending garnish – the flavor and texture will give you a delightful finish. Oh, and lime wedges are a MUST. You basically cube and brown your meat while you chop your veggies, and then simmer it all together until the meat is tender. My big mistake – neither my grocer nor I had the red chilies called for, so I used a whole dried habenaro. I had intended to pull it out about half way, but I forgot? Twas just a tad spicier than I had wanted, but still quite enjoyable. 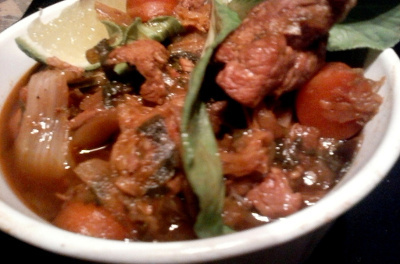 I'll confess to chowing down on the meat and veggies, and found I had quite a bit of the broth leftover. I didn't have any wontons, and ramen or soba noodles didn't seem quite right (yes, I try to keep an Asian pantry)... I pulled some pieroghi from the freezer and boiled them up while I sauteed onions and some of the leftover cabbage - and then tossed them all together with the broth! 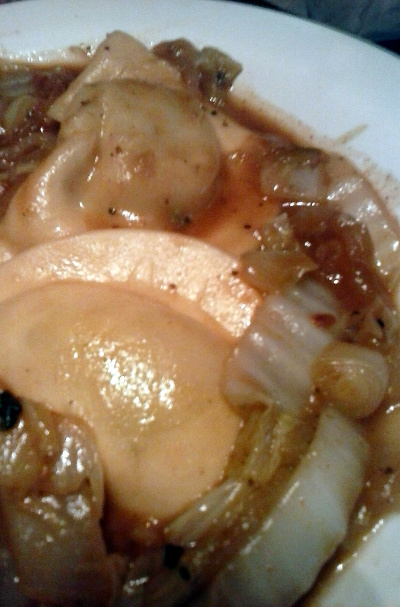 Ok, it's more than a little culture clash – asian onion soup with polish ravioli – so I added the crowning insult of a dollop of sour cream. It was DELISH!!! !